If you’ve followed along, you likely noticed that life spun me around like a pair of socks in the dryer for the last two or three years. I’ve had a lot going on and had not been able to get back ‘in the game’, so to speak. During that time, I’d ordered 40 lbs. of boneless skinless chicken breast from Zaycon Foods. The delivery came mid-summer last year (or the year before?) and my good intentions for repackaging and handling this big bag of meat did not go as planned. So, life changed once again – I switched to a different job, a new sector of industry – and I had four days of downtime in between. Time to can some chicken! I thawed the block overnight in a larger cooler (sorry, this is not the safest method and I’m not promoting it – just saying that’s how we roll around here, and I cannot recall the last time I had tummy ick). 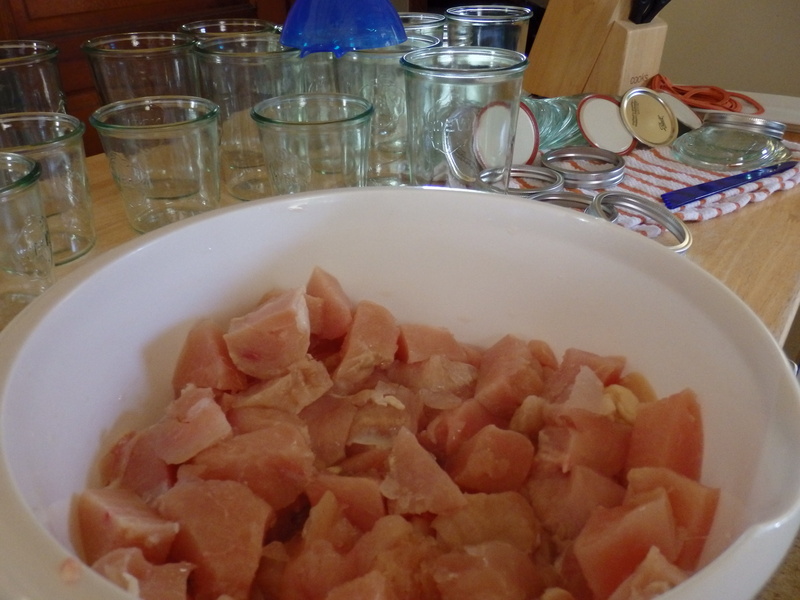 Then I began the process… a hot vinegar bath for all of the jars and utensils, then cut the chicken into chunks and pack it into the jars, raw. Chicken can only be canned with a Pressure Canner. If your canner does not have gauges on it then you need to step away from this sort of project. Seriously. You could kill yourself or someone else if you don’t use the proper canner. 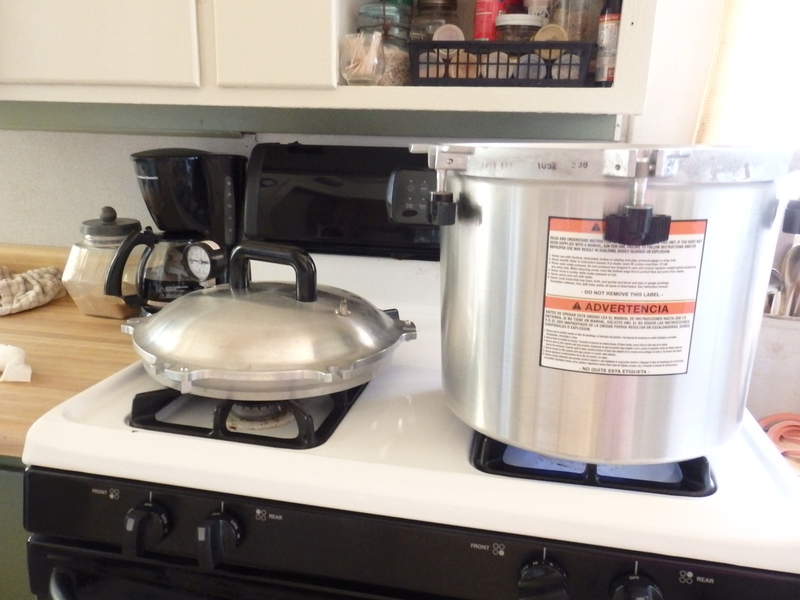 Also – a pressure cooker is not the same thing as a pressure canner. Use the right tools for the job. For the sterilization step, I simply used tap water as hot as I could get it and added a quarter gallon of vinegar. Each item was dipped and rinsed in the water and then set out for a quick dry. These beautiful, functional jars are from Weck. They’re my favorite for meat processing, as they are a much thicker glass than the standard canning jar – and they look so good on the shelf. I have several of the Weck jars, but not quite enough for this project, so I filled in with good ol’ Ball jars. Always add new metal tops when canning, and reuse any of the rings that are not rusty. 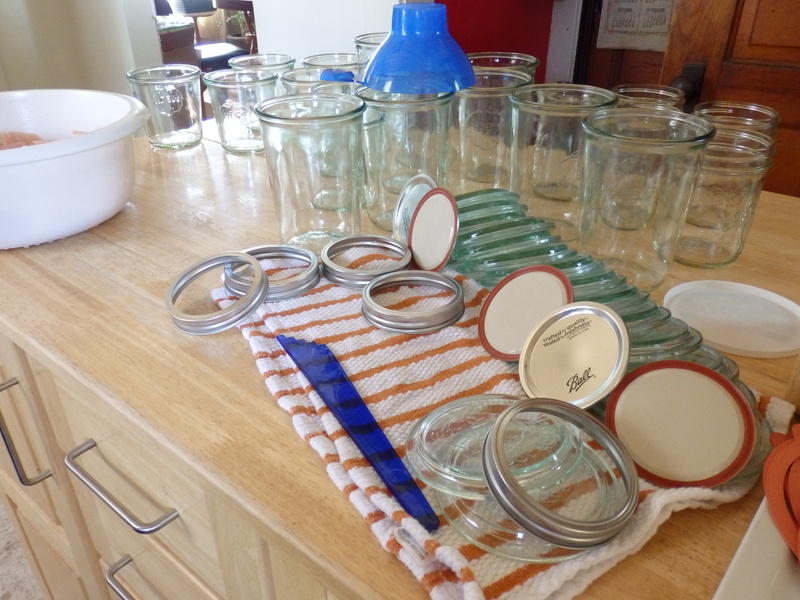 The Weck jars will need new rubber seals each time they’re used. 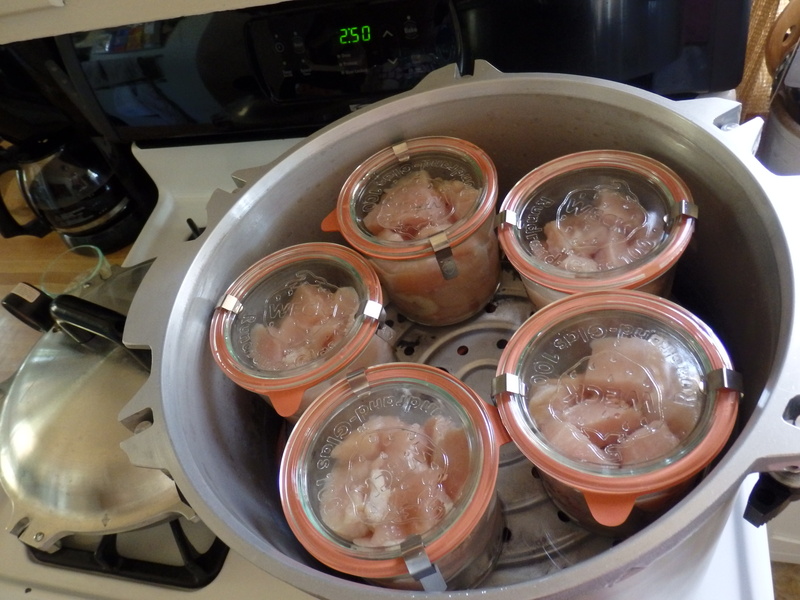 While I packed the jars with the chicken chunks, I got the water into the canner and set it on the stove to heat. 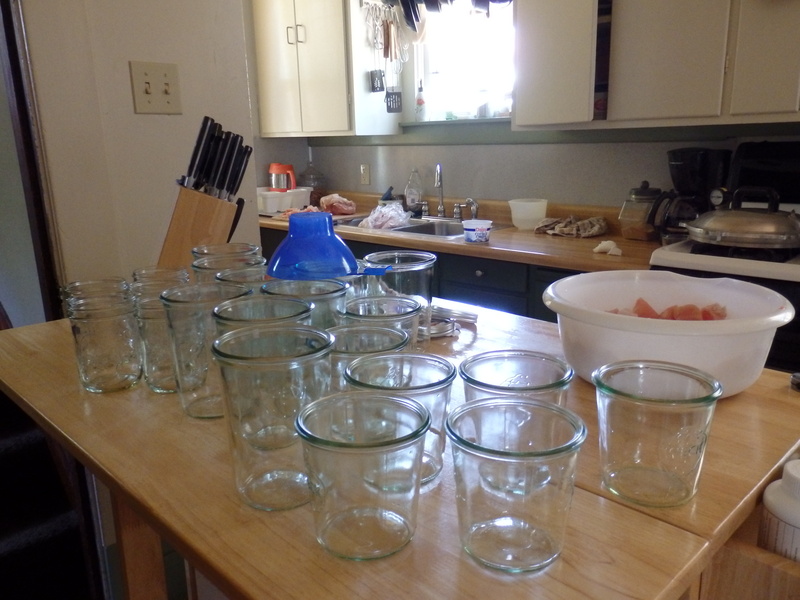 It takes a while, so I knew I could get the jars in before the water was too hot to set cool jars into. With so much chicken to process, there was no way to do it all in one session. 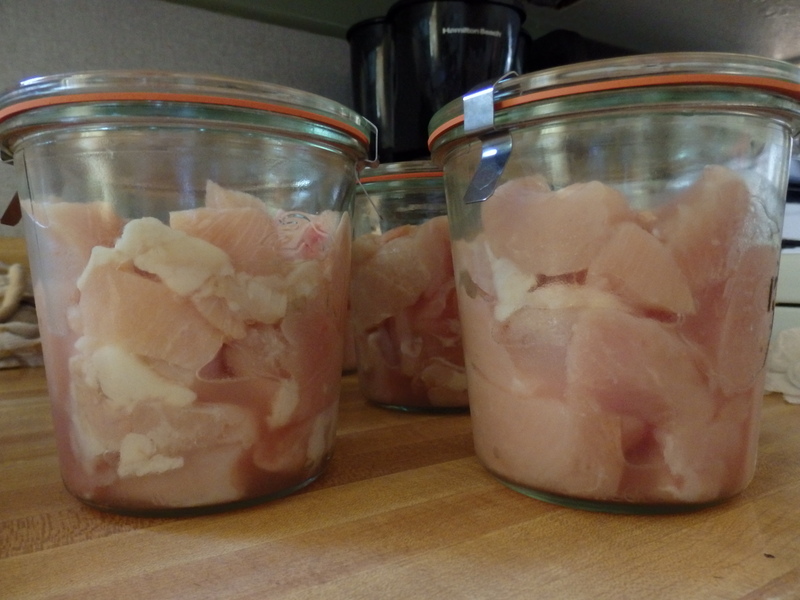 I cut up and packed the first 20 lbs of chicken and got as many jars as was safe into the canner – a double stack. 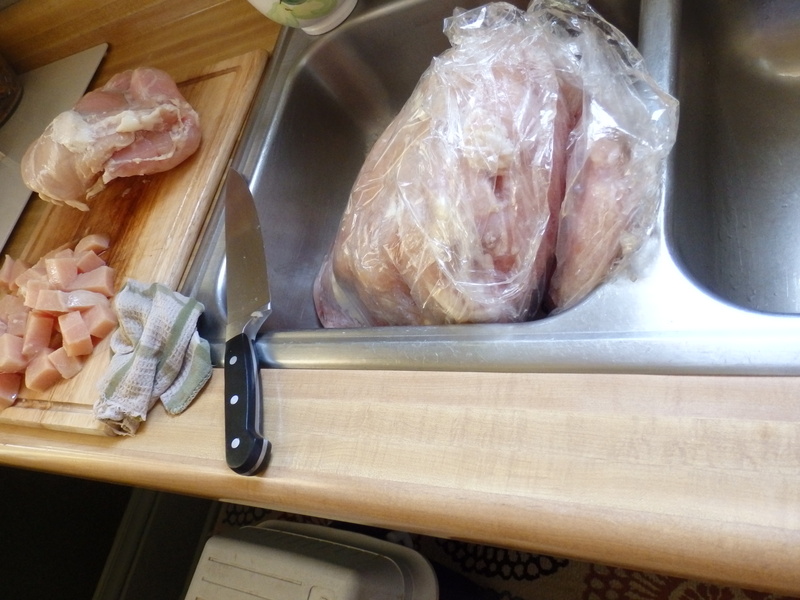 As you can see, there is still a lot of chicken in the bowl, and more waiting over yonder in the sink… as shown in that second picture from the top. It’s a good thing I started this project before noon. Instructions are so very important when canning. Raw pack meats are going to go through an intense cooking process and the juices and pressure involved require that you leave a lot of space between the packed food and the top of the jar – head space. This is for safety purposes, make certain you follow this step. Once the water was in the canner (see your instructions to make sure you’ve put sufficient water in your canner), and the jars were packed in, I was ready for the first batch. Use a reputable source for the instructions, aided with the instruction booklet from your canner. Quarts of raw pack chicken take 90 minutes processing time. This is serious business folks – always follow the instructions to the letter when you’re canning foods. Safety is key. In between batches, it’s important to allow the canner to cool and release pressure on its own. Forcing the cool down will do serious damage to the canner, your kitchen or your body. Be patient and allow for this down time. Once the pressure has returned to zero, you are ready to pull out those steaming batches of canned goodness and start the next batch. Take a serious cue from me and start waaaay before noon, not just before. This is a time consuming process, but oh so very worth it in the long run. Time sure flies when you’re having fun! 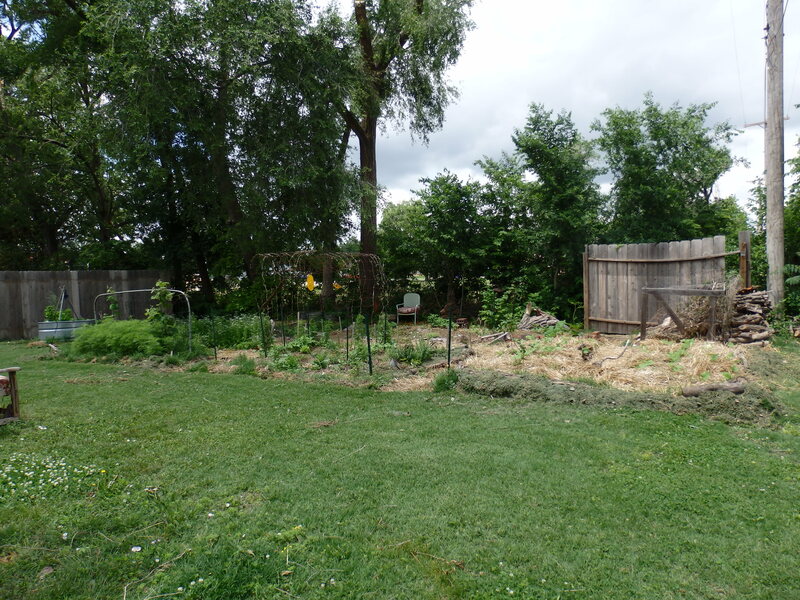 As I hinted in the last post, I’ll add a few pictures of my ‘front’ garden, which is home to the tomatoes and peppers – but more than that, it’s a work in progress. I want to create a self-sustaining wildlife garden, full of native drought resistant, self-seeding or perennial plants that will feed the butterflies, moths, bees and birds. The rear garden is a resounding success in terms of good bug population. The earthworms are outstanding! I see spiders duck and run every time I turn the water on. Winged things are numerous, mostly tiny flies and wasps, but also lacewings, ladybugs, dragonflies, blue winged wasps and parasitic wasps. It’s a good thing, because I’ve seen a good share of the bad bugs too! Nearly discouraged, I’ve fought to keep my course with the gardens. They’re not pretty and tidy. There are no neat rows of voluptuous vegetables. That’s a tough pill to swallow for an OCD type, let me tell you. 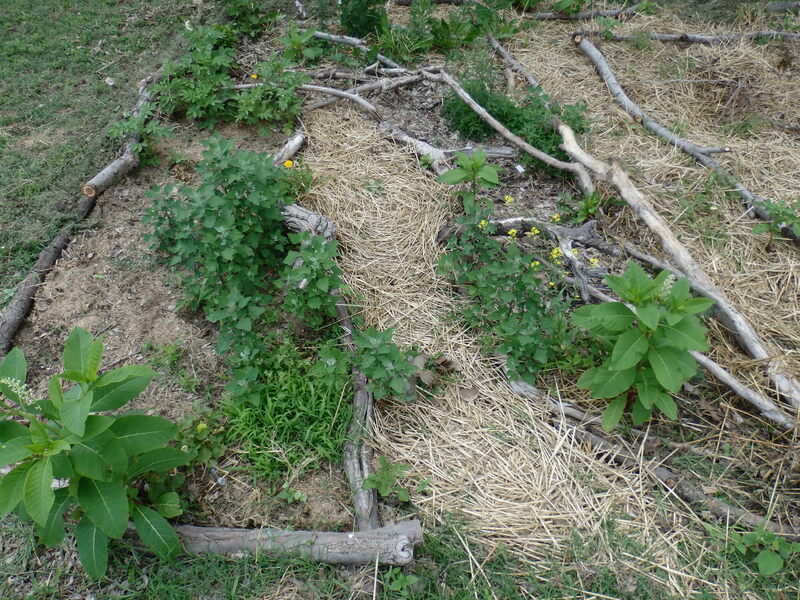 What I have, as you’ve seen, is a structured series of beds, fraught with untidy, self-strewn weeds and such. Oh My! The good news is that it’s working. I’m experimenting with self-seeding, to allow the garden to become less time intensive for me. What I learned by mistake is that many things we weren’t really aware of will survive a hard winter. You’ll be as surprised as I was to learn that Pole Beans (particularly heirloom rattlesnake beans) will overwinter and produce heartily. I now have them springing up nearly everywhere in my garden, right along my overly productive cilantro. Cantaloupe has also made its own special appearance, along with dill, parsley, watermelon, potatoes, and lettuce. 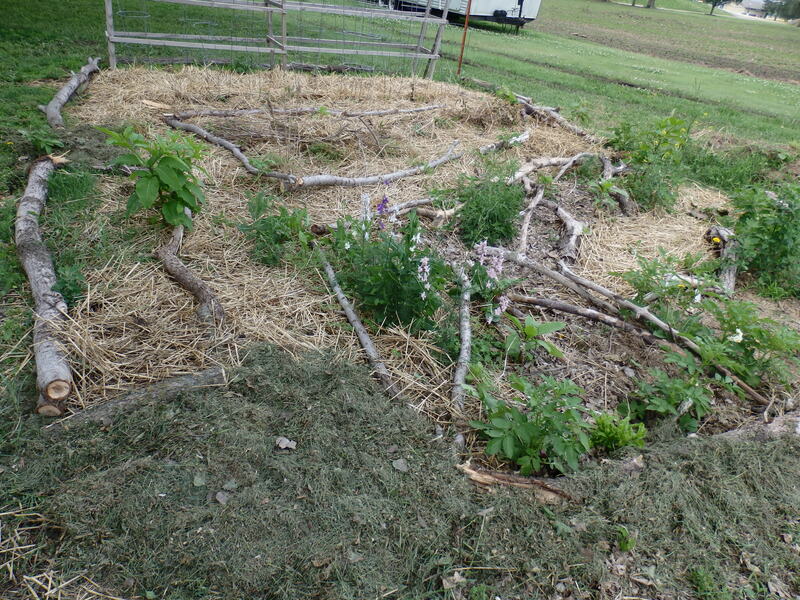 I’m going to purposely allow several plants to rot on the vine/plant, and just do a minimal rake in and leaf cover at the end of the growing season. This will allow me to find out how many of these wonderful, fabulous heirlooms will simply grow when they’re ready to grow. Rough paths and patches of ‘weeds’ for winged visitors. 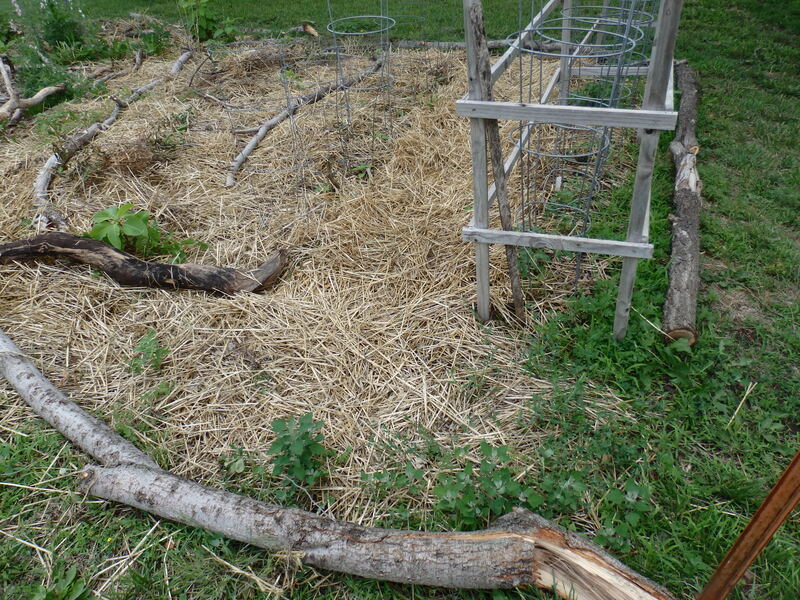 Permanent wood strip cage for the tomatoes, with space for wire cages inside. It’s hard to tell, but I dug a deep trench between the tomatoes and the peppers and have filled it with a deep layer of straw. I fill the trench to provide deep watering, as the Kansas heat will take a toll on these plants if I conventional water them. Tree limb lined paths and patches of native weeds and self-seeding flowers. It’s an oft-made mistake, to expect that a DIY construction project will be completed within the projected time frame. And then there’s the extended time frame that occurs when said project goes on indefinite hold. Definitely in limbo status, our kitchen project is now in its eighth month. Since the kitchen has been extremely functional for the past five months, we’ve had no pressure to move it forward, along with little to no enthusiasm for the process. This little portion of the project was an addition to the original plan. The skillets had been planned for an under cabinet hanging mount installation (the corner is part of the unfinished business) in the corner cubby. I was concerned about this plan, as I couldn’t satisfactorily determine the weight limits of the cabinet top I have planned. I’d considered purchase of a wall mount iron rack to mount to the top of this window frame and I’d finally located a rack to match the measurements and was nearly ready to place my order. 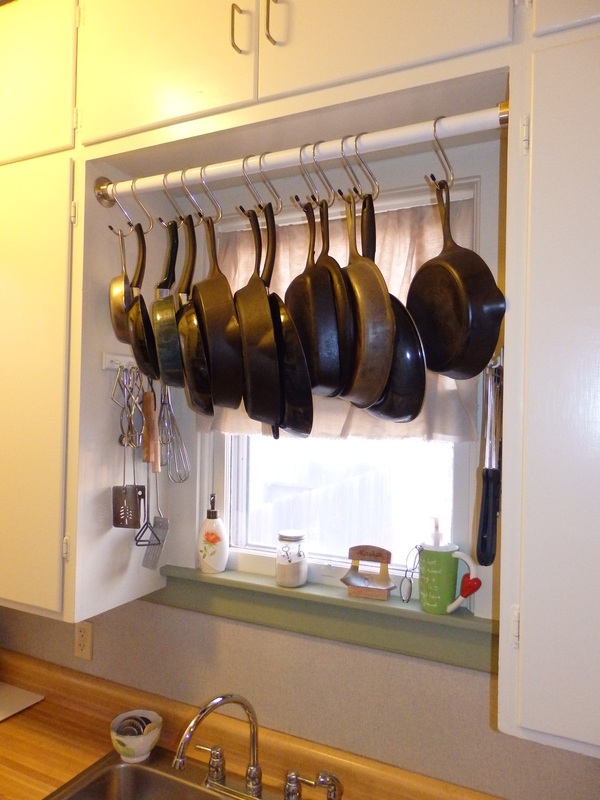 Then it struck me that the best option for weight support would be between the two cabinets, with a closet rod for the rack. 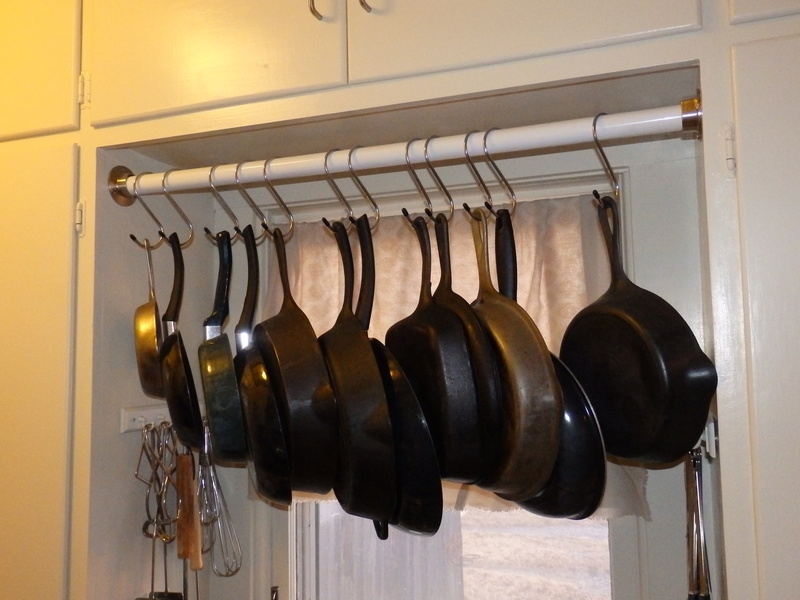 A quick trip to the nearest hardware store and I’d found my skillet rack: a metal closet rod, cut to the proper length, with closet rod mounts, and large (and hard to find) S-hooks with rubber tips for added safety. 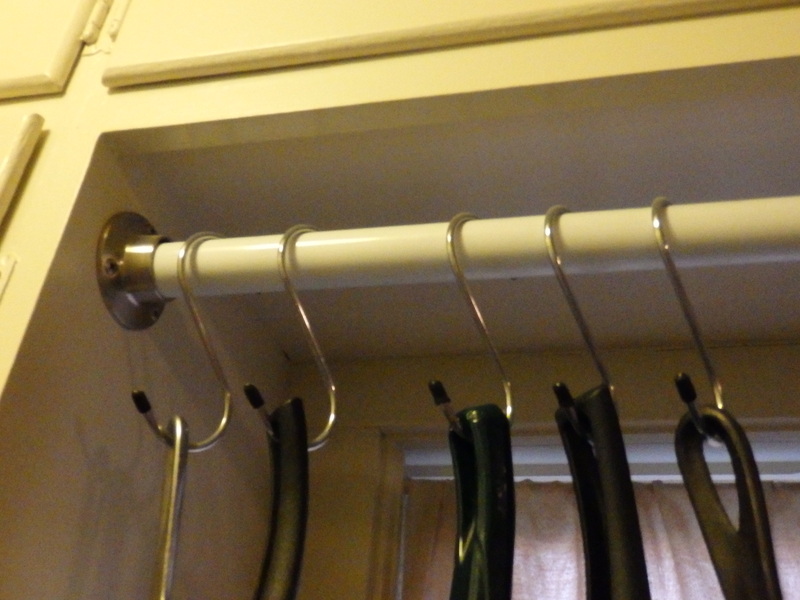 The total cost was less than $40, with the S-hooks being the greater portion of the cost. SCORE! In the corner cubby, I decided to pull one of the cabinet doors to leave an open cabinet. I can’t decide if it’s a win, but it’s not been a loss. Sometimes you just opt for so-so and call it good. Seriously, it keeps the open cabinet door out of the work space and has spared a few head injuries. Also, I installed the towel rack and utility rack. The utility rack isn’t pretty, but it’s been one of the handiest options so far. How nice to just grab what you need rather than opening a cabinet or drawer. I’m not showing you the bottom portion of the corner, as that’s an incomplete part of the project. Here’s the close-up of the open cabinet. Part of the remaining project is to paint the cabinet interiors the pale green you see on the sink window sill. It will add some depth and contrast. 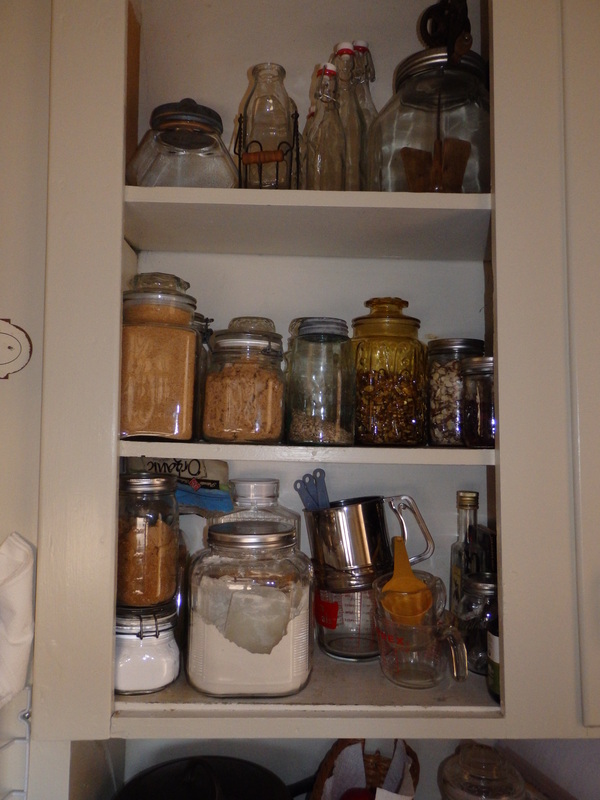 In the meantime, this cabinet functions well and looks decent enough, with my obsessive use of glass containers. The impact is the new hardware and paint. Hardware was chosen to match the faucet as I had no reason to change it out. I chose a dark paint color for the bottom cabinets, trim and corner walls, to continue the dark line of the oven. I chose a monochrome light color for the upper walls, trim, and cabinets to give the illusion of space. The floors will be dark laminate tile squares, while the ceiling will be white bead-board. 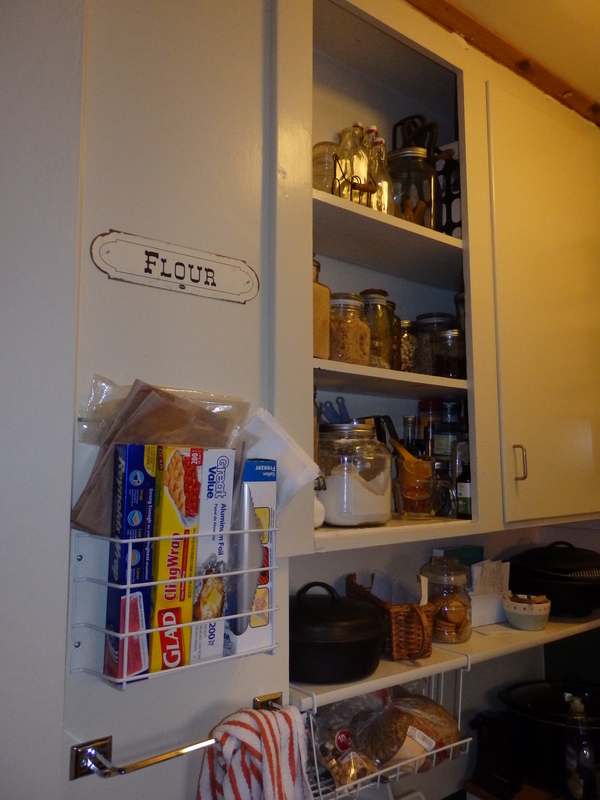 We opened the cabinet above the stove to allow easy access to cooking condiments, seasonings and spices. The bonus is the exposed brick from an original stove chimney. We’ll frame off the opening and give the brick a sealer coat to liven up the color. 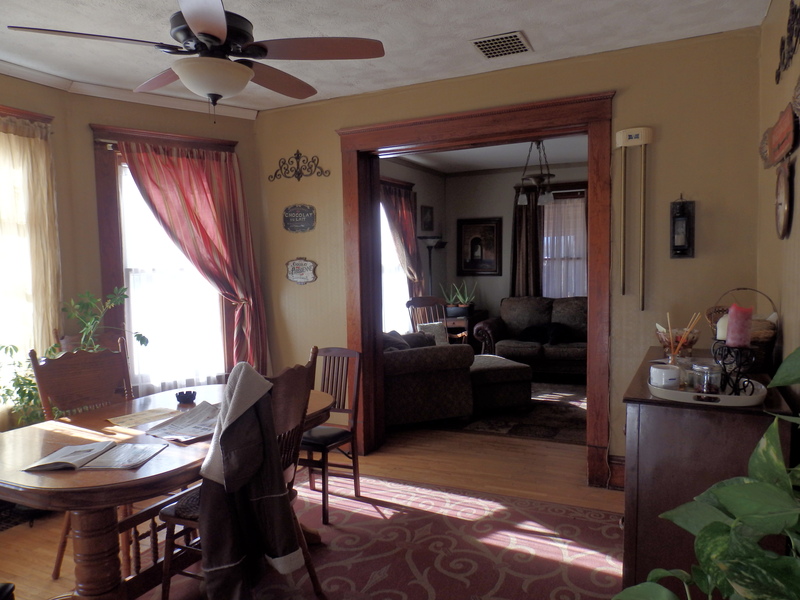 The dining room has returned to its normal state (and left with its own unfinished projects, lol). We live here and it’s evident. 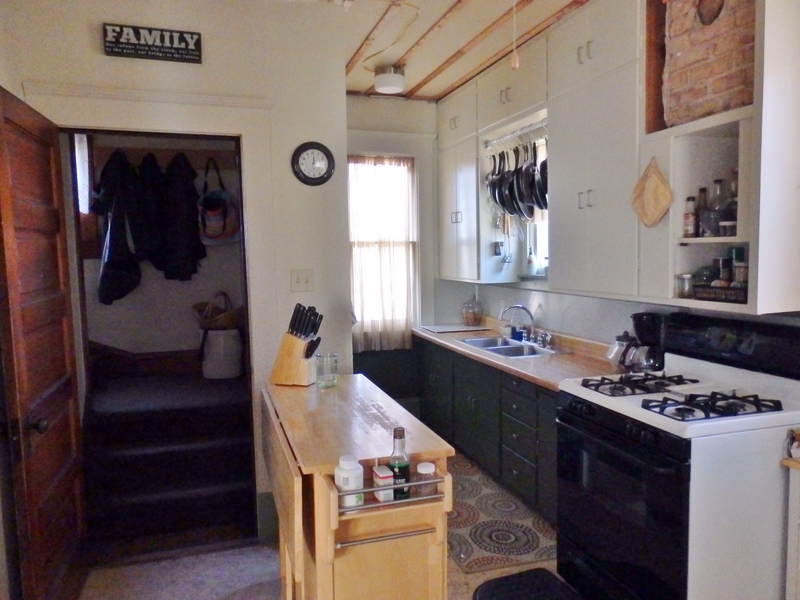 There’s where we are, with a practical approach project and a work in progress kitchen.